42 mm monobloc matt black ceramic case, screw-down winding crown in black PVD-treated steel engraved with the Tudor logo, chronograph pushers in black PVD-treated steel, rapid date corrector with PVD shield motif at 9 o’clock on the middle case, fixed matt black ceramic bezel with engraved tachymetric scale, sapphire crystal with a black seal, black dial with bronze tinted hands and hour markers, Tudor caliber 7753 self-winding movement with chronograph function, 30-minute totalizer at 3 o’clock and 12-hour totalizer at 6 o'clock, small seconds hand at 9 o'clock, date at 4:30, approximately 46 hours of power reserve, brown alcantara strap, folding buckle. Water resistant to 500 ft (150 m). 42 mm monobloc matt black ceramic case, screw-down winding crown in black PVD-treated steel engraved with the Tudor logo, chronograph pushers in black PVD-treated steel, rapid date corrector with PVD shield motif at 9 o’clock on the middle case, fixed matt black ceramic bezel with engraved tachymetric scale, sapphire crystal with a black seal, black dial with bronze tinted hands and hour markers, Tudor caliber 7753 self-winding movement with chronograph function, 30-minute totalizer at 3 o’clock and 12-hour totalizer at 6 o'clock, small seconds hand at 9 o'clock, date at 4:30, approximately 46 hours of power reserve, black rubber strap, folding buckle. Water resistant to 500 ft (150 m). 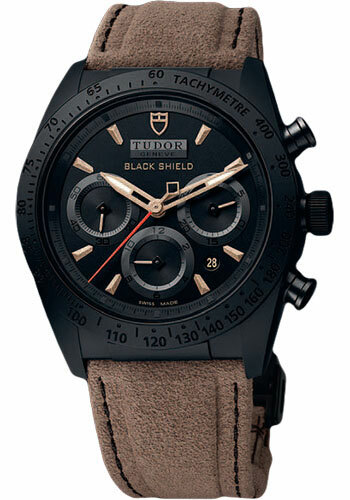 42 mm monobloc matt black ceramic case, screw-down winding crown in black PVD-treated steel engraved with the Tudor logo, chronograph pushers in black PVD-treated steel, rapid date corrector with PVD shield motif at 9 o’clock on the middle case, fixed matt black ceramic bezel with engraved tachymetric scale, sapphire crystal with a red seal, black dial with red hands and hour markers, Tudor caliber 7753 self-winding movement with chronograph function, 30-minute totalizer at 3 o’clock and 12-hour totalizer at 6 o'clock, small seconds hand at 9 o'clock, date at 4:30, approximately 46 hours of power reserve, black leather strap with red stitching, folding buckle. Water resistant to 500 ft (150 m). 42 mm monobloc matt black ceramic case, screw-down winding crown in black PVD-treated steel engraved with the Tudor logo, chronograph pushers in black PVD-treated steel, rapid date corrector with PVD shield motif at 9 o’clock on the middle case, fixed matt black ceramic bezel with engraved tachymetric scale, sapphire crystal with a red seal, black dial with red hands and hour markers, Tudor caliber 7753 self-winding movement with chronograph function, 30-minute totalizer at 3 o’clock and 12-hour totalizer at 6 o'clock, small seconds hand at 9 o'clock, date at 4:30, approximately 46 hours of power reserve, black rubber strap, folding buckle. Water resistant to 500 ft (150 m).